Can Dropbox go from consumer hit to business success? IT administrators managing Dropbox deployments are supposed to have an easier time with it soon, thanks to improvements that the company announced Wednesday. The company is rolling out a redesigned interface for examining logs of user activity within an organization, new folders that make it easier to create and manage a shared workspace for teams and mobile access management capabilities. The move is part of Dropbox's push to get its product used by more large organizations, in addition to its strong base of consumer users. The company recently announced that it has more than 200,000 organizations subscribed to its business offering, and improving these capabilities is not only a means of helping existing users, but also a way to prove to new ones that the company is serious about reaching businesses. 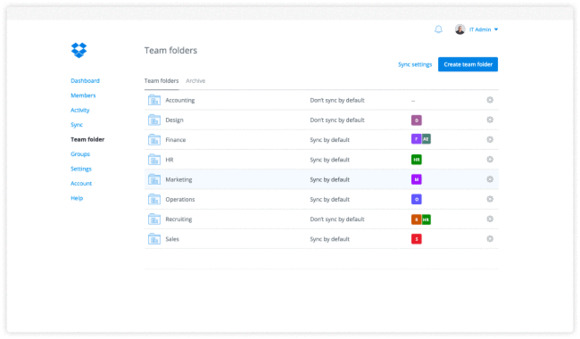 The biggest user-facing change in all this will be new features for managing team folders, which are available in private beta. Administrators will be able to import users and the groups they belong to from systems like Active Directory, and map those users directly to folders from the teams that they belong to. Using a new sync management tool, administrators will then be able to lay out which shared folders should be added to new users' computers, based on their role. That way, they're not inundated with an avalanche of files preloaded on their devices on their first day, but they can still access all of the information through Dropbox's web and mobile interfaces. Admins will also be able to manage access to company data at a folder and sub-folder level, so it's possible for the HR team to create a folder for employee evaluations, and then share sub-folders with managers on each team without giving them access to evaluations from outside their team. On the purely administrative side, people with access to the Dropbox Admin Console will start seeing a new design rollout that should make it easier for them to get their work done with easier access to frequently used tools. They'll also get access to an enhanced log manager that's supposed to make it easier to find out important information about things like when an employee changed access to a file or when something was deleted. It's all information that Dropbox made possible for people to access before, but which required users to export logs and open them in spreadsheet software. Finally, the company will be introducing new functionality in the future to let administrators control how many devices people can use to access company data stored in Dropbox. With that feature, it should be possible for companies to specify that users can only access Dropbox through one mobile device and one computer, which can help keep business data under wraps. The mobile access management capabilities won't take the place of an enterprise mobility service like MobileIron or AirWatch, and they're not designed for organizations that already use that software. Instead, the feature is aimed at small businesses that need easy and fairly rudimentary tools to control their data. It will be interesting to see if these improvements to the management experience will boost adoption of Dropbox across businesses. The company has been building up steam in the business market recently.